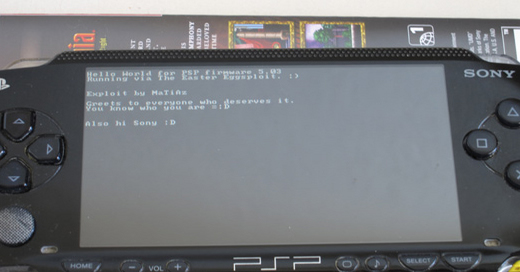 Here's the third TIFF exploit for the PSP, enjoy. Don't dismiss the exploit even if it doesn't work on the first time, it's *very* unstable. This release works _only_ on fat PSPs. The slim version will come out later. I'll be screwed :P The people who need to be credited will know it anyway. P.S. Just wait a few days, there's a bit of awesomeness coming up. 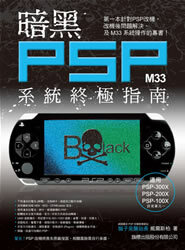 可以執行在所有PSP上，包含PSP-3000 . 是指買來的3000型的系統是 5.03 的嗎 ? 還是說只要我買一台3000型 , 就可以照你的方法使用了嗎 ? 疑慮2 ：h.bin檔案放到記憶卡根目錄下. 到底是要放到寄以卡裡面哪裏ㄋ ? 目錄又是指哪裏ㄋ ? 不好意思 最後還有一個問題 , 我看了影片教學 , 裡面那台PSP的系統是5.03 , 那我如果憲再去買一台也是5.03的嗎 , 還是說需要改ㄋ ?